At Awareity, we understand the critical importance and the truly world-changing advantages of having the right tools AND the right awareness for every User (employees, clients, third-party service providers, contractors, vendors, etc.) 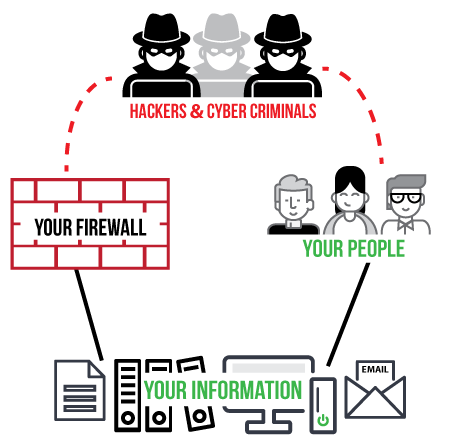 who has access to your organization’s network and sensitive data. Chances are that awareness includes annual Information Security Awareness Training, Cyber Security Training, or other compliance regulations, but what about the other 364 days a year? The right awareness for every User requires not only annual certifications but ongoing awareness (daily, weekly, monthly, situational, etc.) to eliminate commonly exploited GAPS allowing ransomware, malware, and other evilware to gain unauthorized access to your valuable, sensitive, and proprietary data. In other words, the right awareness is important to keep your people, organization, and information safe. We do the research and prepare the information for your Users so you don’t have to! • The most complete software-as-a-service (SaaS) (tools, reports, compliance documentation, audit documentation, etc.). • The most effective Information Security Awareness Training, Cyber Security Training, and Hacker Awareness training for eliminating dangerous and costly GAPS that grow bigger and bigger starting the day after conventional annual training is completed. • Efficient and completely customizable policy management solutions to match an organization’s specific and custom needs with automated management and reminders for Users and Administration as well as legal-ready documentation and audit-ready reporting. • Additional specialized awareness training for HIPAA, FERPA, and PCI including awareness reminders and updates throughout the year.